If you open the moveguard health check you can see your body height and weight at the top. 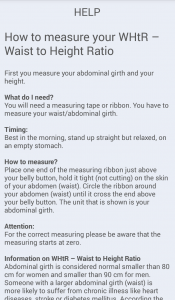 Underneath your Body-Mass-Index (BMI) is displayed. 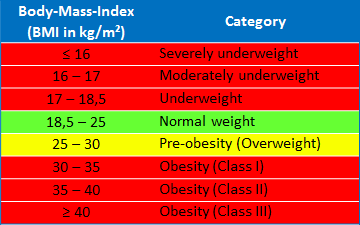 The colours indicate the status of your BMI (green = very good; red = you urgently need to change something). The table on the right shows how the BMI is medically evaluated. 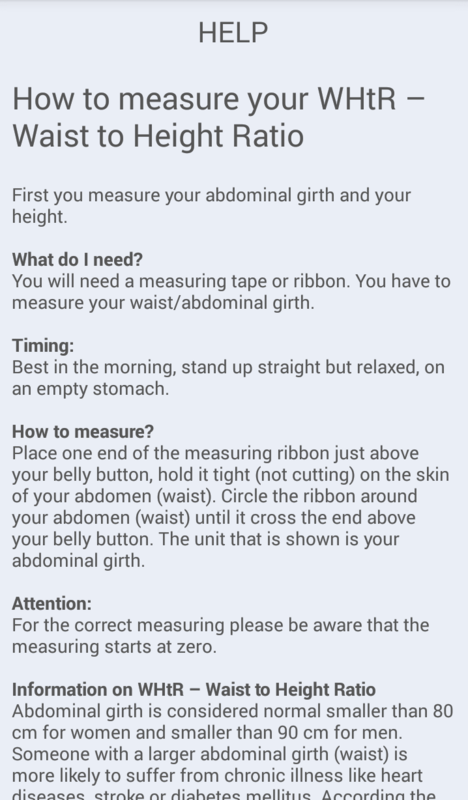 Below your BMI your Waist-to-Height-Ratio (WHtR) – your abdominal girth divided by your height in centimetres – is displayed. The Waist-to-Height-Ratio gives information on the distribution of your body fat. Many scientific studies have shown that the body fat distribution, rather than just weight, is a potential risk factor in terms of illness. A higher level of fat on the stomach is more dangerous than on the buttocks and thighs. The colours indicate the status of your WHtR (green = very good; red = you urgently need to change something). In the table below you get information on how the WHtR is medically evaluated. 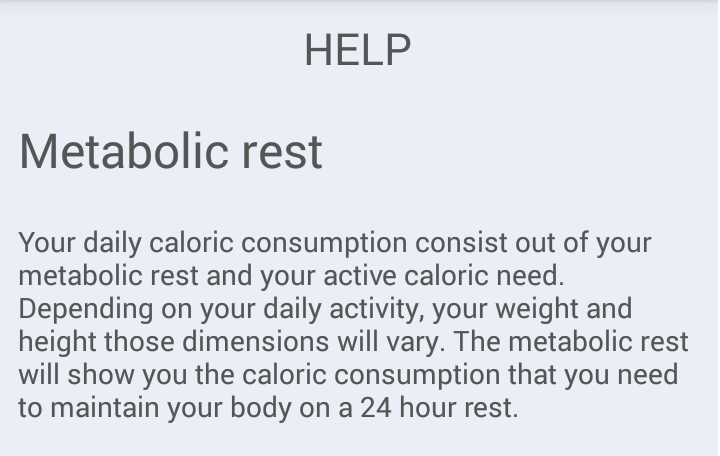 The displayed resting metabolic rate in the moveguard health check is the amount of calories (kcal) you burn every day at rest, on an empty stomach, in the morning dressed in light clothes, and at room temperature. The amount of energy burned is slightly higher (approx. 10%) when you sit or lie. The cardiovascular system is responsible for supplying your organs and tissue with blood (and in this way with oxygen), as well as for removing waste metabolic products (carbon dioxide). At rest, the heart contracts and expands around 60 to 80 times per minute. During contraction, pressure is asserted on the arterial walls. This is known as the systolic blood pressure. The pressure created when the heart relaxes (i.e. when the heart refills with blood) is referred to as the diastolic pressure. 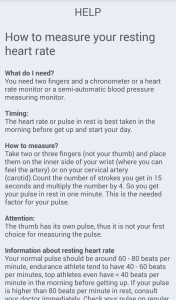 When measuring the blood pressure both values are determined. Why do your blood pressure values differ? Your blood pressure responds to internal and external influences, such as changes in the weather and in temperature, physical and psychological strain and stress. The time of day also affects the values (during the day the values are higher than at night). 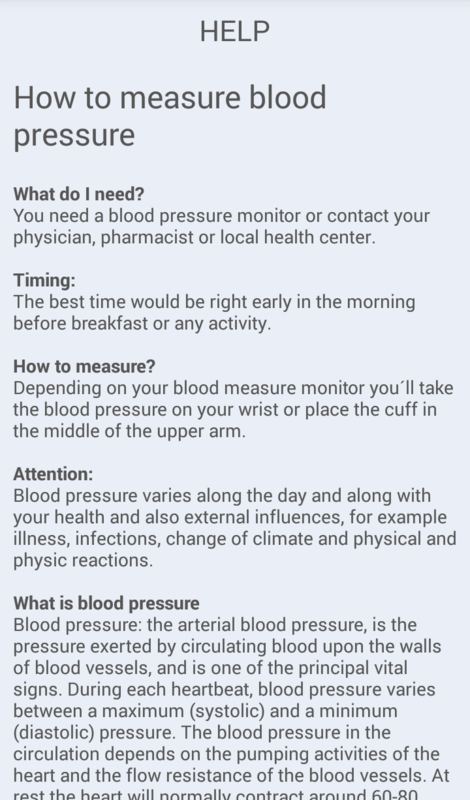 The blood pressure measurements taken at your physician’s, pharmacist’s and at home may therefore differ. 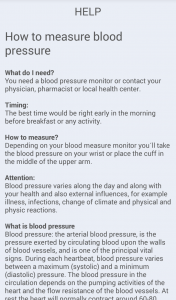 Why is it important to measure your blood pressure regularly? A reliable evaluation can only be obtained through regular blood pressure measurements using the same device. High or irregular blood pressure is a risk factor and can lead to a number of serious conditions (e.g. heart attacks or strokes). For this reason high or irregular blood pressure has to be treated with medication. However, blood pressure can easily be restored to normal levels with the help of regular physical exercise and a change of diet. According to the World Health Organization (WHO), blood pressure values of <120/<80 mmHg are regarded as optimal, systolic/diastolic values of <130/<85 mmHg as normal blood pressure and blood pressure of 140/90 mmHg or higher as harmful to health. 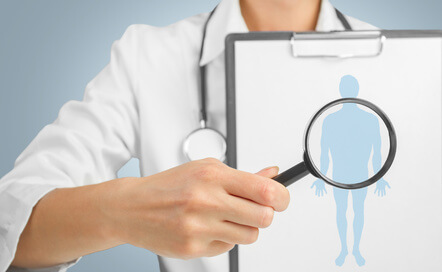 In this case it is necessary to contact your physician to treat high blood pressure with medication. 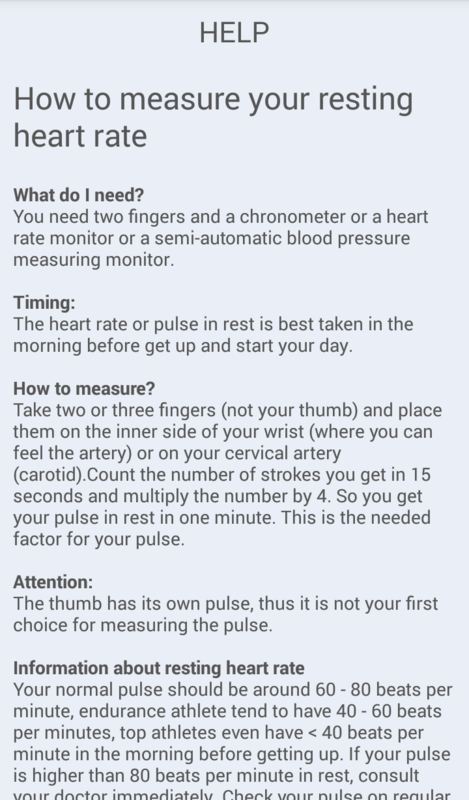 The table below shows how the blood pressure is assessed medically by the WHO. The colours indicate the status of your blood pressure (green = very good; red = you urgently need to change something). Your normal resting heart rate should be between 60 and 80 beats per minute. Endurance athletes have a resting heart rate between 40 and 60 beats per minute and highly-trained endurance athletes even have a resting heart rate of less than 40 beats per minute. If your resting heart rate is above 80 beats per minute, you should consult your physician as soon as possible and in all events before starting to exercise. When you check your resting heart rate regularly, you may notice an increase of more than 10 beats per minute. This can be a sign of infection or over-training (consult your physician as soon as possible!). A decreasing resting heart rate indicates that your training has positive effects on your heart circulation system. Training on a regular basis and a change of diet can help to normalize or even reduce your resting heart rate – assuming that you are not suffering from a chronic disease or do not take regular medication. Some medication can increase or decrease your heart rate. For instance, beta-blockers dramatically slow down the heart rate, whereas nicotine, alcohol and caffeine can increase your heart rate.